Five years after it took London by storm, Trevor Nunns original award-winning production of Rodgers & Hammersteins OKLAHOMA! made its American small screen debut in November, with an Image Entertainment DVD and video release that coincided with a national broadcast on PBS Great Performances. As an adaptation from the big stage to the small screen, said the Hollywood Reporter, its about as great as they come. The Washington Post agreed, The effect is spellbinding...OKLAHOMA! remains rich and rousing Americana. The Philadelphia Inquirer simply called it a landmark. This miraculously fresh-feeling production, in the words of the New York Times, was first seen at Londons Royal National Theatre in the Summer of 1998. Directed by Trevor Nunn, choreographed by Susan Stroman and designed by Anthony Ward, it starred British favorite Maureen Lipman (since known to film audiences for her role in THE PIANIST as Aunt Eller, ballerina Josefina Gabrielle as Laurey, West End song & dance man Jimmy Johnston as Will Parker, and American Vicki Simon as Ado Annie. In the pivotal role of Jud Fry: American Shuler Hensley who went on to win both an Olivier and Tony Award for his performance. As Curly the cowboy: an Australian newcomer named Hugh Jackman. Shortly after Trevor asked for the rights to OKLAHOMA!, recalls R&H President Ted Chapin, he sent us a videotape from an Australian TV station, profiling the young man he wanted to cast as Curly. It was a cheery documentary about this kid who clearly had a lot of potential, and tons of charisma Even from the clips of him performing in Australian productions of BEAUTY AND THE BEAST and SUNSET BOULEVARD, it was obvious that he had Curly-like enthusiasm. Though OKLAHOMA! is not a star vehicle, Jackmans sterling performance set the tone on the London stage (We were completely floored, says Chapin, not only by Hugh Jackman, but by the whole production), and helped lead OKLAHOMA! to a record-smashing summer run at the RNT. Cameron Mackintosh quickly arranged a West End transfer for the first half of 1999, but with the OKLAHOMA! cast on hiatus from September until Christmas, the timing was ideal to capture this revelatory production on film. The schedule of the West End transfer was delayed until after the Christmas season since the theater had already booked several holiday attractions, Chapin continues. Trevor was anxious to keep the company together, so he became a persuasive fan of filming the stage production for television. Because Rodgers and Hammerstein had foresight enough to keep a tight hold on their rights, we were able to make the rights available. So, for several weeks in the fall of 1998, Nunn, Stroman and Ward recreated their Oklahoma world on the sound stages of Britains Shepperton Studios. There, Wards sets of frontier farmyards and cornfields were painstakingly replanted, while Stromans revivifying choreography was opened up for the cameras. Neither a literal film of a stage work nor a traditional movie musical, this OKLAHOMA! combined the best of both. Shortly after it was first shown on British TV in late 1999, OKLAHOMA! won the International Emmy Award. After several false starts, Nunn and Stroman brought their OKlAHOMA! to Broadway in the spring of 2002, presented once again by Cameron Mackintosh. Peering into our crystal ball, says Chapin, we had made a determination early on that the film should not be shown in the United States until the Broadway production was given its due. When it closed after a years run, we were as eager as everyone else to get the RNT film version out to an American audience. It may have taken several years over all, but for American critics and audiences alike, it was worth the wait. This OKLAHOMA! rocks, cheered the Hollywood Reporter. Rodgers and Hammersteins creation has rarely, if ever, been realized as perfectly as it is here...Nunn and [co-director Chris] Hunt are able to transcend most of the televised limitations of the stage play to craft something that looks more like an involving film. This OKLAHOMA!, in the words of the Seattle Times, is a revelation...a winner for musical theater fans. Echoed the Los Angeles Times, No fan of musical theater should miss it. The Washington Post praised Nunn for finding new virtues in the masterpiece without sacrificing the old ones. The result, the Post concluded, is a celebration not only of frontier spirit, but also of the American musical itself. OKLAHOMA! was written as America was routing the Nazis and inventing the atomic bomb to make the world safe from Japan. Baby boomers cant imagine the impact this Rodgers and Hammerstein musical about farmers and cowboys settling the Oklahoma territory had on a country mobilized for the noblest of wars. Normally articulate people I know who saw the original cant find words for the experience. 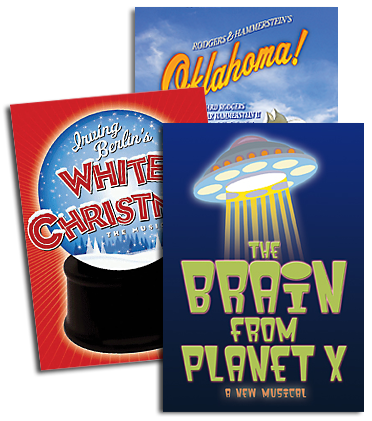 Over the years, though, the show became comfortable and quaint...Now, in Nunns [version], OKLAHOMA! is again embraceable. Although the songs have acquired a life of their own akin to folk music, putting them in the context of the shows characters and having those characters played by a robust, honest, deeply capable cast allows OKLAHOMA! to enter the realm of American mythology. And from Tom Shales of the Washington Post As the cast takes its final bows, we can feel it all over again as so many times before: goose-pimple time, up and down the spine, a jubilant sensation unique to the genre. Youre doing fine, OKLAHOMA! OKLAHOMA! is now available on DVD and VHS formats from Image Entertainment, featuring a bonus documentary supplement on the making of this film; www.image-entertainment.com...The original 1998 RNT cast recording of OKLAHOMA! is available through First Night Records/Relativity.. A national tour adapted from the Nunn and Stroman production is currently playing across North America.